Come on down, Patty Hill says in her warm Southern drawl. You don’t need to be a member to attend a program or lunch in the elegant dining room at The Ebell Club of Los Angeles. Guest speakers are a formidable list of who’s who over the years from a former First Lady of China, authors and reality TV stars. Hill first came to the site 13 years ago, when a friend invited her to a weekly luncheon. “It was so much fun. The food was great.” And she won a raffle prize. She returned with her husband for a dinner dance and has been a regular ever since. The 119-year old women’s club couldn’t ask for a better spokesman. She loves the history, the majesty, and, well, everything about the Club at the corner of Wilshire and Lucerne boulevards. She has held five all-volunteer posts in nine years, adding president to her resume July 1. She oversees a 455-person membership, a staff of 37, a commercial rental division and two philanthropies. In her two-year post she heads a multi-million dollar budget and a long term, painstaking preservation and restoration effort of the historic 75,000-square foot Italian Renaissance style building. Thankfully, she says, architect and board member Carolyn Moser and historic architect consultant John Heller are involved, with a color palette provided by the late architectural historian Martin Weil. The downstairs rooms are almost finished, with the Arts and Letters Lecture Hall upstairs set to begin. It was here, among the lavishly carved bookcases, Amelia Earhart made her final public appearance before her disappearance two months later, Hill notes. 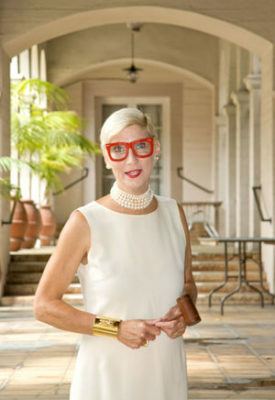 A Memphis native and former New Yorker, Hill sports trendy glasses and blonde tresses, her enthusiasm livens parties at the Ebell and those she attends for her Around the Town column for the Larchmont Chronicle. She’s most proud though of her work as a minority arts co-ordinator at The Beale Street Repertory Company for the deaf, which presents plays by African American writers, and the Harry Bryce Dance Company which performs Afro-Cuban dances. She also served on the board of Jacaranda, musicians who are working professionals, and served briefly on the board of Crossroads School where her son attended. Her son Lionel, 28, designs and builds games for a web company. David, her husband of 35 years, is an author, currently working on his next book. “His passion is the deep south, where he has a home. I say he, not us, because my true second home is The Ebell,” says Hill. “The present members of the Board over which I preside are 14 of the smartest, most creative, and hardest working ladies in this city. I am so humbled and honored to serve such a group,” she adds. The most amazing thing about the site is that it exists at all. “It’s not a mini mall, it’s not a 7-11 or a grocery store, but this particular building is in its original state, which is a miracle for L.A.,” says Hill. A summer barbecue is scheduled for Fri., Aug. 17 in the garden courtyard. “It will be beautiful,” beams Patty. After all it will be at the Ebell, a city and national historic cultural landmark.